than brown but it is just a really dark chocolate color. Thoughts: This is another helmet that I made. It seems as though the Padres only wore a cap like this in '62. Thoughts: Just an early variation of the helmet below as this helmet here had a real sticker for the logo instead of a screen printed logo. Thoughts: Time for an early change in uniform design. This helmet brings back thoughts of Dave Winfield. lived design. Tony Gwynn did a lot of damage in this helmet. and uniforms that went to pinstripes. The Padres actually visited the World Series in this helmet. will be remembered for a long time by a youngster named Kahlil Greene. Manufacturer: Well, I assume it's not made by Fotoball, but there is no name listed. Maybe K2? Thoughts: This is the Sunday uniform that the Padres wore in salute to the Armed Forces. The actual helmet they wear is slightly different because the letters are all white and the helmet is a darker green. Thoughts: A very bizarre promotional giveaway. 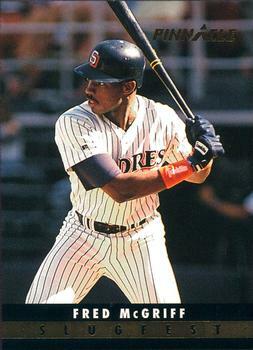 The Padres don't were helmets like this and the design of this helmet lacks any air holes on the top and the Adjustrap has only three connections. It is a very poorly made helmet and the entire helmet is painted. Paint is chipping off everywhere. Let's hope this isn't what all the new helmets will be like. Thoughts: Promotional giveaway I think during the 2007 season. Thoughts: Promotional giveaway during the 2008 season. Thank goodness they never wore something like this! Thoughts: Promotional giveaway, but I have absolutely know idea when, but being a Sports Products helmet, it has to be pre-2005.